It’s packed with features, and that’s why it scratches the itch so well. It’s something you don’t notice until after you’ve already begun using it. Three co-researchers remotely collaborated across Japan using MetaMoJi’s award-winning virtual meeting app, Share Anytime. Each professor reported that the simultaneous editing environment of Share Anytime made it much easier to visualize each other’s inspirations and ideas, even when meeting virtually from remote areas. Since the app can accommodate over a hundred people sketching ideas at one time, it became an ideal tool for collaborative research, brainstorming and presentations. 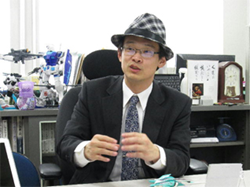 Associate Professor Masakazu Kozakai from Tamagawa University College of Engineering hosted a “Share Note” meeting with his colleague, Minoru Okada from the Senshu University School of Commerce, and his research student, Shiori Kitami who was in the hospital at the time in her home prefecture of Niigata. Share Anytime permits meeting owners to host a virtual whiteboard session on their tablet computers by sending an email invitation via a “Share Note”. In this case, the researchers were all working on iPads, but the app is also sold for Windows 8 and Android tablets.